Janice Long and Gary Davies present the pop chart programme, first broadcast on 20 June 1985. Featuring Sting, Fine Young Cannibals, China Crisis and Harold Faltermeyer. Browse content similar to 20/06/1985. Check below for episodes and series from the same categories and more! Hello, may I be the first to bid you a fond welcome to Top Of The Pops. In other words, Janice is basically saying, "Hi, how you doing?" What's on the show tonight, Jan? And we've got Sting, as well! And a fine bunch of young, upstanding men first. In other words, to get us underway, here are the Fine Young Cannibals! # Won't you come on home? # We worry, won't you come on? # That I must get drunk every night? # Who do you know, where will you stay? # We're sorry, won't you come on home? Oh, the Fine Young Cannibals and Johnny Come Home! I think Roland Gift's voice is just, like, brilliant. At 28, it's Sting - If You Love Somebody Set Them Free. That is brilliant, Sting, and If You Love Somebody. just to be on Top Of The Pops tonight. They are Mai Tai, this is History. # Why did you do it? # Did you have to be that mean? Oh, Mai Tai and History! -If that doesn't make you dance, nothing will. -OK, I'm glad you stopped there! We're going to have a look at some tips for the top. watch for him flexing his muscles in a moment. This is Tomb Of Memories. straight in at 24, Tears for Fears and Head Over Heels. and doesn't it look as if they've nicked the library from Ghostbusters? it's another of the charity records which is in the charts. This is Marti Webb and Ben. I think so anyway. 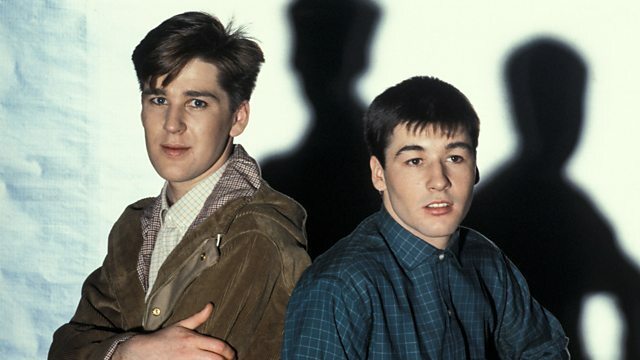 They're at number 26, they are China Crisis. This is King In A Catholic Style! China Crisis, King In A Catholic Style. Lovely boys! Yeah, they are. Here are the top 40. It's Skipworth & Turner at 40, Thinking About Your Love. A new entry at 39, The Conway Brothers and Turn It Up. Oh, the excellent Redskins at 38, a new entry, Bring It Down. New entry at 37, The Damned and The Shadow Of Love. Philip Bailey, Walking On The Chinese Wall at 36. At 35, Bronski Beat and Marc Almond in I Feel Love. Bryan Ferry, Slave To Love at 34. At 33, So In Love, OMD. At 31, Depeche Mode and Shake The Disease. A new entry at 30, Paul Young, Tomb of Memories. At 29, Phyllis Nelson and Move Closer. If You Love Somebody Set Them Free. Sting at 28. Debarge, The Rhythm Of The Night at number 27. And it's King In A Catholic Style, China Crisis up to 26. 25, Jimmy Nail, Love Don't Live Here Anymore. Tears For Fears, a chart entry at 24, Head Over Heels. And at 23, Go West and Call Me. Stephen "Tin Tin" Duffy with Icing On The Cake at 20. David Bowie's Loving The Alien at number 19. All Fall Down, Five Star at 18. And at 17, Katrina & The Waves, Walking On Sunshine. This is Moore and Lynott this week at 16, Out In The Fields. At 15, Johnny Come Home, The Fine Young Cannibals. N-n-n-nineteen, Paul Hardcastle at 14. Bruce Springsteen, I'm On Fire, Born In The USA. And at 12, it's Ben from Marti Webb. At number 11, Duran Duran, A View To A Kill. Here's the biggest climber on the chart this week. Axel F and Harold Faltermeyer. Harold Faltermeyer and Axel F.
Love the lyrics to that! OK, back to the charts. At number nine, here's Mai Tai and History. At eight this week, it's Animotion, I want you, I want you. Obsession. At number seven, Kool & The Gang and Cherish. And here they are on stage in Montreux. Fellow members of the Eddie Grundy fan club at six. It's Scritti Politti and The Word Girl. And at number five, Billy Ocean. Suddenly. I'd hoped this would make number one, but it hasn't. It's down to four. Marillion and Kayleigh. And going up six places to number three, Madonna and Crazy For You. Once you get this lodged in your brain you'll never get rid of it. It's Sister Sledge up to two with Frankie. # Do you remember me. # Sister Sledge and Frankie at two. You're going to have to stop singing because here's the number one. For the second week running, The Crowd and You'll Never Walk Alone. We'll leave you tonight with Prince and Paisley Park. I shall bid you a fond farewell. What she's trying to say is, goodnight.